If you’re looking for the latest and greatest pure GPL, open source Asterisk® 13 aggregation with a pure GPL, open source graphical user interface, then today’s another lucky day for you. Last week, we introduced the Ubuntu 14 edition of Incredible PBX™ for Asterisk 13, and this week we have the CentOS/Scientific Linux flavor to share. This is an independent aggregation based solely upon GPL code. Unlike the competition, the operating system and cloud repository to support the product also are pure GPL open source code. And the Incredible PBX installers themselves are pure GPL open source code. You are more than welcome (encouraged!) to examine, improve, and share your discoveries. Incredible PBX for CentOS 6.9 and 7 follows our standard install procedure which means it’s up to you to first create a CentOS 6.7 or 7 platform. If you prefer Scientific Linux or Oracle Linux, feel free to start there. All work equally well as a base platform and are supported by a worldwide group of developers. Once your OS platform is in place, simply run the Incredible PBX installer. After 30-60 minutes of whirring, you’ll end up with an awesome (free) state-of-the-art Asterisk-based VoIP server with the very latest LTS version of Asterisk 13 as well as dozens of turnkey Incredible PBX applications. So enjoy a nice lunch while the Incredible PBX installer works its magic. No user intervention is required during the installation procedure. All text-to-speech (TTS) applications work out of the box. You can add Google’s Speech Recognition to many Incredible PBX applications by following our 5-minute tutorial. And a GPL installation script for free faxing with HylaFax and AvantFax is also included. Be sure to download the latest Incredible Fax installer! CAUTION: Installing Incredible PBX on the CentOS 7 platform is still a work in progress that is suitable for pioneers only. For production systems, stick with 6.9. Let’s begin by installing 64-bit CentOS 6.9 or 7 on your favorite hardware or Desktop. Or you may prefer to use a Cloud provider1 that already offers a preconfigured CentOS image. In the latter case, you can skip this section. Now log into your server as root and issue the following commands to put the basic pieces in place and to reconfigure your Ethernet port as eth0. Make a note of your IP address so you can log in with SSH. If you’re on a virtual machine platform, now would be a good time to make an export or backup of your CentOS image. The minimal install is about 500MB. Don’t forget to first remove your hardware address (HWADDR) and network UUID from /etc/sysconfig/network-scripts/ifcfg-enp0s3 or whatever file name was assigned to your hardware. The saved image will be bootable with DHCP network support anywhere down the road. NEWS FLASH: For those wanting to test things out using VirtualBox, a Scientific Linux 7.1 Remix image (2GB) is now available on SourceForge. It gets you to right here in the install process. Adding Incredible PBX to a running CentOS 6.9 or 7 server is a walk in the park. To restate the obvious, your server needs a reliable Internet connection to proceed. Be sure to use SSH (or Putty on a Windows machine) to begin because the installer locks the firewall down to your local network and the IP address of the machine from which you perform the install. Log into your new server as root at the IP address you deciphered in the ifconfig step in the CentOS installation procedure above. WARNING: If you’re using a 512MB droplet at Digital Ocean, be advised that their setups do NOT include a swap file. This may cause serious problems when you run out of RAM. Uncomment ./create-swapfile-DO line below to create a 1GB swap file which will be activated whenever you exceed 90% RAM usage on Digital Ocean. Now let’s begin the Incredible PBX install. NOTE: To more clearly identify packaging as we move forward, there has been a change in the Incredible PBX naming and numbering scheme. Henceforth, the file name and version reflects the Asterisk version, the GUI version, the Incredible PBX release number, and the OS platform. 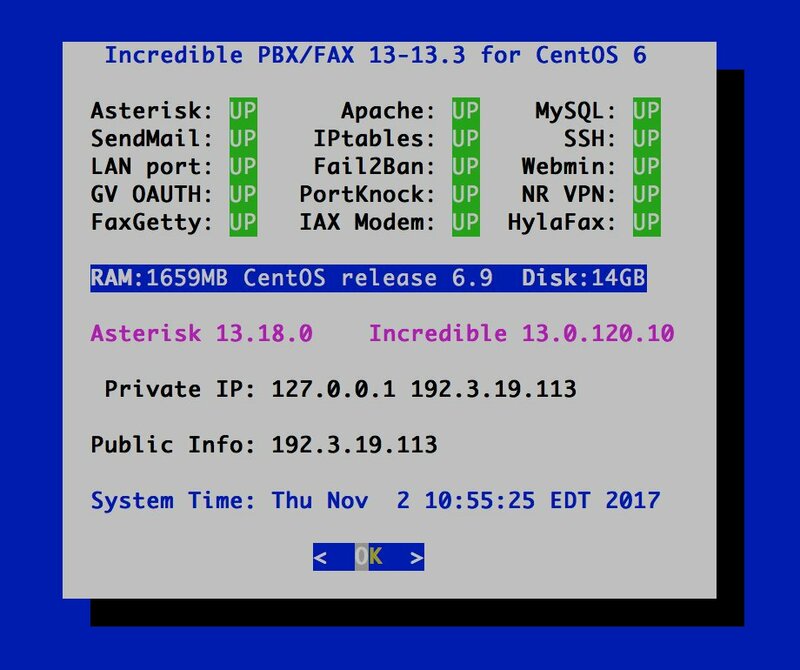 For example, incrediblepbx13-12.0-centos tells you the product includes Asterisk 13, the version 12 GUI, .0 release number, and the CentOS platform. Incredible PBX includes an automatic update utility which downloads important updates whenever you log into your server as root. We recommend you log in once a week to keep your server current. 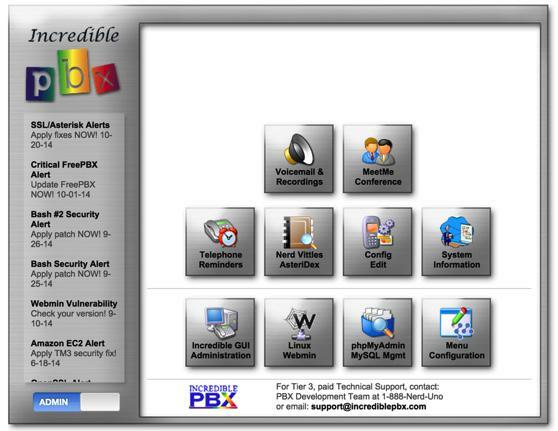 You can access the Incredible PBX GUI using your favorite web browser to configure your server. Just enter the IP address shown in the status display. Choose Incredible GUI Administration from the Admin menu of the Kennonsoft GUI (shown above) by clicking on User to switch. The default username is admin and the password is what you set when the install completed. Now edit extension 701 so you can figure out (or change) the randomized passwords that were set up for your 701 extension and voicemail account: Applications -> Extensions -> 701. If you’re behind a hardware-based firewall, verify the NAT setting: YES. 701 password. Choose Settings -> Accounts and click the New button. Fill in the blanks using the IP address of your server, 701 for your account name, and whatever password you created for the extension. Click OK.
Now you’re ready to connect to the telephones in the rest of the world. If you live in the U.S., the easiest way (at least for now) is to set up a free Google Voice account. Google has threatened to shut this down but as this is written, it still works. We will have an update for OAUTH authentication support soon. The safer long-term solution is to choose several SIP providers and set up redundant trunks for your incoming and outbound calls. The PIAF Forum includes dozens of recommendations to get you started. If you want to use Google Voice, you’ll need a dedicated Google Voice account to support Incredible PBX. If you want to use the inbound fax capabilities of Incredible Fax, then you’ll need an additional Google Voice line that can be routed to the FAX custom destination using the GUI. The more obscure the username (with some embedded numbers), the better off you will be. This will keep folks from bombarding you with unsolicited Gtalk chat messages, and who knows what nefarious scheme will be discovered using Google messaging six months from now. So keep this account a secret! We’ve tested this extensively using an existing Gmail account, and inbound calling is just not reliable. The reason seems to be that Google always chooses Gmail chat as the inbound call destination if there are multiple registrations from the same IP address. So, be reasonable. Do it our way! Set up a dedicated Gmail and Google Voice account, and use it exclusively with Incredible PBX. It’s free at least through 2013. Google Voice no longer is by invitation only so, if you’re in the U.S. or have a friend that is, head over to the Google Voice site and register. IMPORTANT: Be sure to enable the Google Chat option as one of your phone destinations in Settings, Voice Setting, Phones. That’s the destination we need for The Incredible PBX to work its magic! Otherwise, all inbound and outbound calls will fail. If you don’t see this option, you may need to call up Gmail and enable Google Chat there first. Then go back to the Google Voice Settings. Click Save Changes once you adjust your settings. Under the Voicemail tab, plug in your email address so you get notified of new voicemails. Down the road, receipt of a Google Voice voicemail will be a big hint that something has come unglued on your PBX. UPDATE: Google has improved things… again. You may not see the options documented above at all. Instead, you may be presented with the new Google Voice interface which does not include the Google Chat option. But fear not. At least for now there’s still a way to get there. After you have set up your new phone number, click on (1) Settings -> Phone Numbers and then click (2) Transfer (as shown below). That returned the old UI. Make sure the Google Chat option is selected and disable forwarding calls to default phone number. One final word of caution is in order regardless of your choice of providers: Do NOT use special characters in any provider passwords, or nothing will work! Now you’re ready to set up your Google Voice trunk in the GUI. After logging in with your browser, click the Connectivity tab and choose Google Voice/Motif. To Add a new Google Voice account, just fill out the form. Do NOT check the third box or incoming calls will never ring! IMPORTANT LAST STEP: Google Voice will not work unless you restart Asterisk from the Linux command line at this juncture. Using SSH, log into your server as root and issue the following command: amportal restart. If you have trouble getting Google Voice to work (especially if you have previously used your Google Voice account from a different IP address), try this Google Voice Reset Procedure. It usually fixes connectivity problems. If it still doesn’t work, enable Less Secure Apps using this Google tool. UPDATE: Google continues to tighten up on obtaining more than one Google Voice number from the same computer or the same IP address. If this is a problem for you, here’s a workaround. From your smartphone, install the Google Voice app from iPhone App Store or Google’s Play Store. Then open the app and login to your new Google account. Choose your new Google Voice number when prompted and provide a cell number with SMS as your callback number for verification. Once the number is verified, log out of Google Voice. Do NOT make any calls. Now head back to your PC’s browser and login to http://google.com/voice. You will be presented with the new Google Voice interface which does not include the Google Chat option. But fear not. At least for now there’s still a way to get there. After you have set up your new phone number and opened the Google Voice interface, click on the 3 vertical dots in the left sidebar (it’s labeled More). When it opens, click Legacy Google Voice in the sidebar. That will return you to the old UI. Now click on the Gear icon (upper right) and choose Settings. Make sure the Google Chat option is selected and disable forwarding calls to whatever default phone number you set up. Under the Voicemail tab, plug in your email address so you get notified of new voicemails. Then click Save Settings. Down the road, receipt of a Google Voice voicemail will be a big hint that something has come unglued on your PBX. 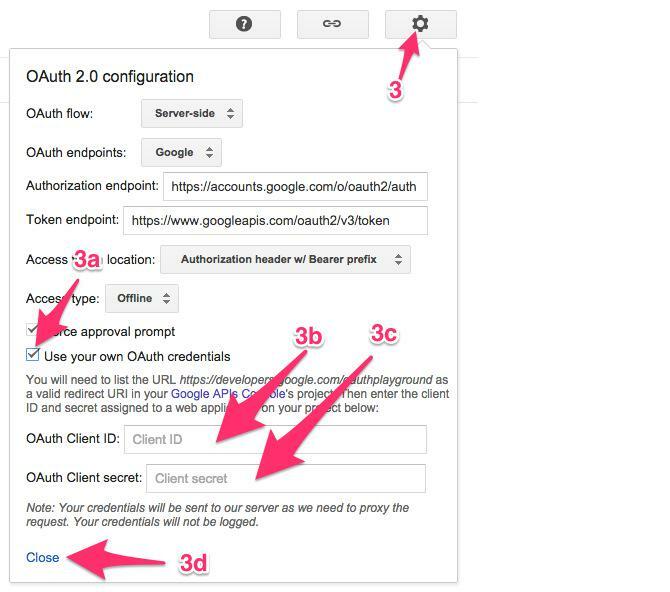 Now it’s time to obtain your OAuth 2 credentials. Even though it’s a bit more work on the front end, the good news is you won’t have to worry about your Google Voice trunks failing when Google phases out plain-text passwords. The other good news is you won’t be passing your plain-text Google Voice credentials across the Internet for everyone in the world to see. While you’re still logged into your Google Voice account, you need to obtain a refresh_token which is what you’ll use instead of a password when setting up your Google Voice account with XiVO. Here’s how. 1. Be sure you are still logged into your Google Voice account. If not, log back in at https://www.google.com/voice. 2. Go to the Google OAUTH Playground using your browser while still logged into your Google Voice account. 3. Once logged in to Google OAUTH Playground, click on the Gear icon in upper right corner (as shown below). 4b. 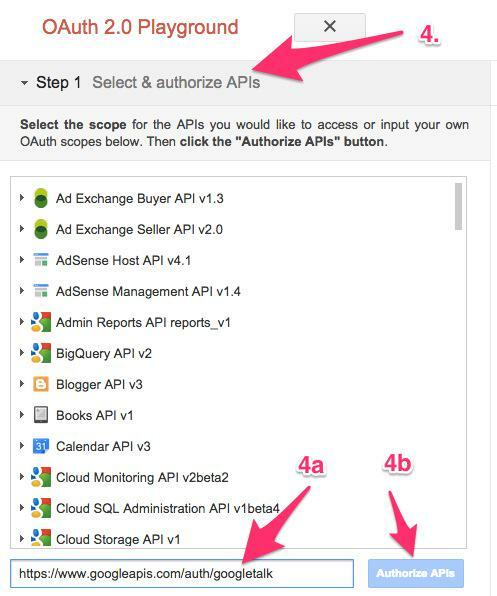 Click Authorize APIs (blue) button. 5b. When the tokens have been generated, Step 2 will close. 6. Reopen Step 2 and copy your Refresh_Token. This is the "password" you will need to enter (together with your Gmail account name and 10-digit GV phone number) when you add your GV trunk in the Incredible PBX GUI. Store this refresh_token in a safe place. Google doesn’t permanently store it! 7. Authorization tokens NEVER expire! If you ever need to remove your authorization tokens, go here and delete Incredible PBX Google Voice OAUTH entry by clicking on it and choosing DELETE option. Switch back to your Gmail account and click on the Phone icon at the bottom of the window to place one test call. Once you successfully place a call, you can log out of Google Voice and Gmail. You can avoid one-way audio on calls and touchtones that don’t work with these simple settings in the GUI: Settings -> Asterisk SIP Settings. Just plug in your public IP address and your private IP subnet. Then set ULAW as the only Audio Codec. The IPtables firewall is a complex piece of software. If you need assistance with configuring it, visit the PIAF Forum for some friendly assistance. We’re pleased to introduce our latest backup and restore utilities for Incredible PBX. Running /root/incrediblebackup will create a backup image of your server in /tmp. This backup image then can be copied to any other medium desired for storage. To restore it to another Incredible PBX server, simply copy the image to a server running Asterisk 13 and the same version of the Incredible PBX GUI. Then run /root/incrediblerestore. Doesn’t get much simpler than that. Every time you log into your server as root, Incredible PBX will ping the IncrediblePBX.com web site to determine whether one or more updates are available to bring your server up to current specs. We recommend you log in at least once a week just in case some new security vulnerability should come along. In the meantime, we encourage you to sign up for an account on the PIAF Forum and join the discussion. In addition to providing first-class, free support, we think you’ll enjoy the camaraderie.